Spicy chicken tikka with thin-sliced red onion topped with a fried egg and wrapped in flaky, buttery Indian flatbread. It is almost impossible to pick just one best roll at the delicious Kati Roll Company in New York’s Greenwich Village. So far I have tried six different rolls, and every one has been even more incredible than the last. I never refrain from making one of my rolls an unda chicken roll, so that is the one I am featuring here. I personally am a complete sucker for anything that has a fried egg added on. But rest assured, the vegetarian rolls are every bit as delicious as the meat-filled ones. One of the big reasons that these rolls are so incredible is that they are rolled in the most superb paratha – delicious, unleavened Indian flatbread made from a wheat flour dough that has been rolled, layered, and fried before being filled with whatever tasty, mouth-watering mixture you decide upon. The dough is soft, flavorful, chewy, and yes, a little bit greasy (I know this likely doesn’t bode well for health, but believe me when I say that every fat-inducing bite is worth it!). Add in tasty pieces of divinely spiced (and hormone-free!) 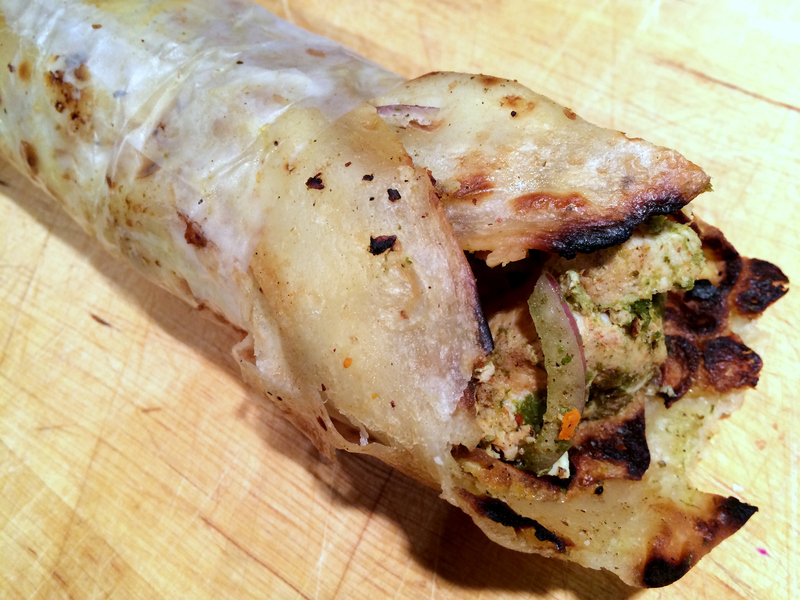 chicken tikka, thinly-sliced red onions, and a fried egg, and you have the heavenly undo chicken roll. Another one of my all-time favorite rolls is the achari paneer roll, which contains blocks of soft, fresh Indian cheese that has been barbecued with achar (Indian pickling spices) and grilled green bell peppers and tomatoes. My husband’s favorite is the sweet and spicy mixed vegetable roll that is filled with beets, carrots, potatoes, peanuts, and raisins. And there are ten other divine-sounding rolls to choose from! Since moving away from New York over a decade ago, I have been on the lookout for a kati roll that even comes close to comparing to those at The Kati Roll Company in New York. I had a pretty good one in Detroit about 5 years ago, and a fairly decent one in Chicago more recently – but unfortunately nothing that could compete with these. I can say this with certainty, because my husband was in New York just a few days ago on business and brought me an undo chicken roll and an achari paneer roll. Even though his flight was delayed and I didn’t get them until nearly 12 hours after he had bought them, they tasted even better than I remembered! Suffice to say, I highly recommend treating yourself to a kati roll – or better yet, two – the next time you are in New York City! Delicious I love chicken tikka. Oh god that flaky, buttery Indian flatbread, looks so delicious. Do you think I could get the recipe for this rolled, layered, and fried flatbread?It certainly leaves my mouth watering…Thanks for sharing! Let me know if you do, I’d love to hear about it! I’m surprised that these delicious rolls aren’t more ubiquitous. I totally agree with you as to why we don’t have many of these roti places to eat at. Why??? We desperately need somethng like this in Minneapolis. 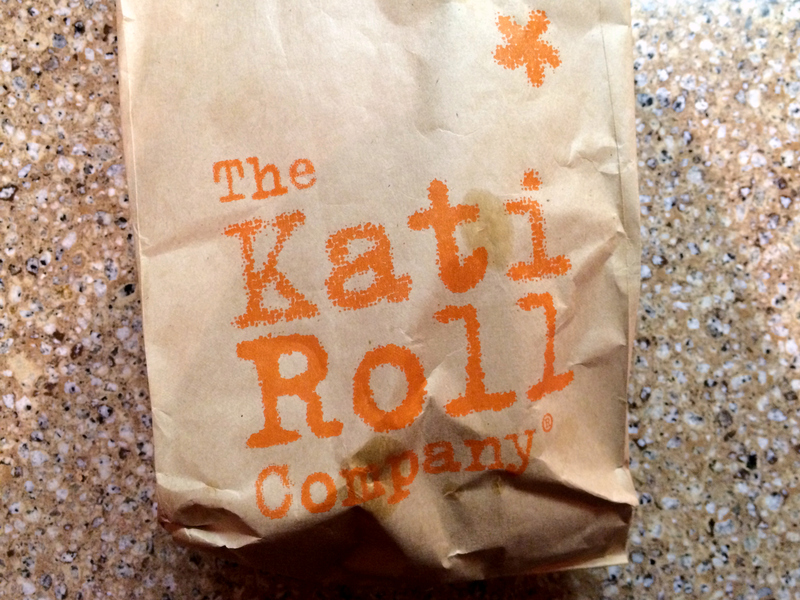 I used to love eating at the Kati Roll when we we lived on the east coast. I love that you used to eat at this place too! Yeah, it’s hard to imagine it wouldn’t be popular in any city. Cheap and appropriately sinful, and perfect for vegetarians and meat-eaters alike!